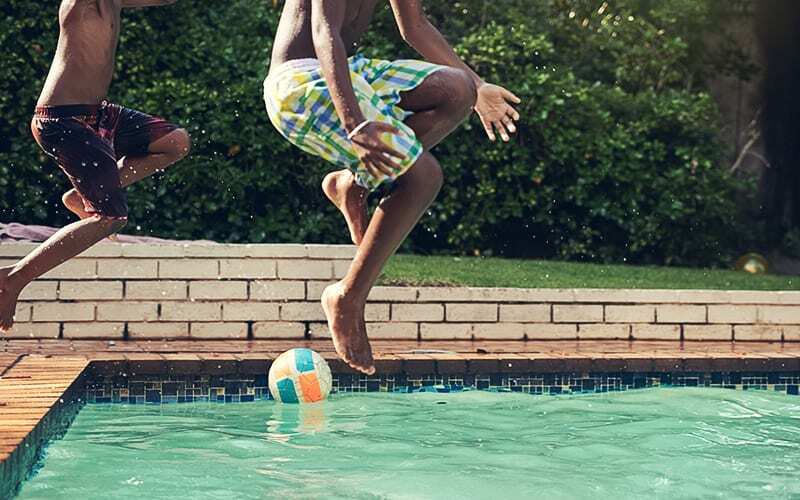 Splashing around in the backyard pool is fun for the entire family, but it can quickly become dangerous if proper safety precautions aren’t met. In order to keep your family and others safe, there are a number of pool fences, pool alarms, and covers you can buy to block off the water when adults aren’t around to supervise. Take a look at the pool security devices out there so you can purchase the proper equipment to prevent tragedies. If you’re not by the pool, you probably won’t want anyone playing in the water. 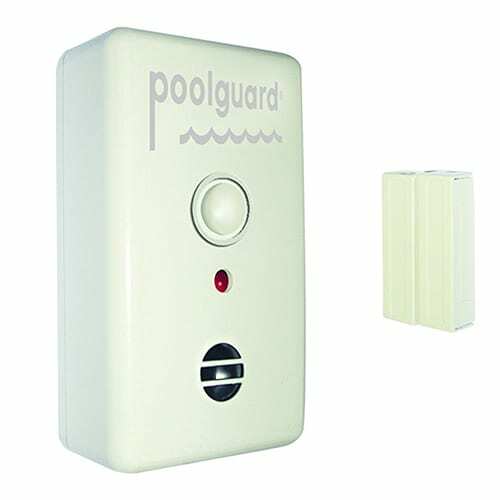 To keep your mind at ease, you can choose from pool gate alarms or water alarms that will tell you immediately if someone is near or in your pool. There are a ton of different types of pool alarms on the market, so check out the different models below. These swimming pool alarms are designed to run atop the perimeter of the wall or fence surrounding your pool. 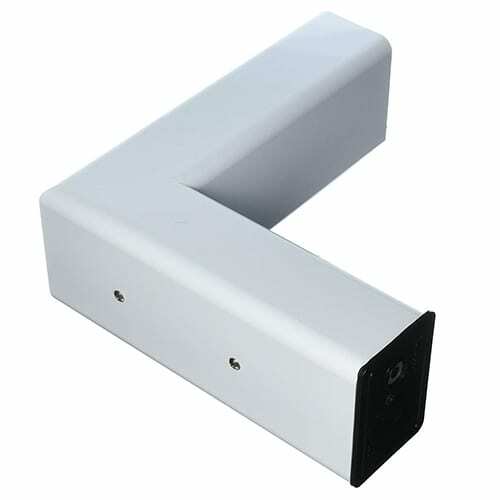 Using either infrared beams to detect movement or magnetic connections that set off an alarm when broken, you’ll know if someone is around your pool. Normally, these fence-mounted pool alarms are a much cheaper alternative to the pool mounted devices (around $50). You’ll have more time to respond to an alarm too since these alerts will sound as soon as someone enters the pool area. If you have agile kids or sneaky neighborhood children, they might be able to evade this type of alarm by jumping the fence. These infrared systems are installed poolside and sound a high-decibel alarm when breached. They’re usually much more expensive, but will tell you when someone is actually in the water. Most models don’t sound unless an object heavier than 15 pounds enters the water. This means it won’t go off if a leaf drops into the pool and give you a scare for no reason. This can help keep your pets or other animals safer too since most critters will come in above this weight class. Since these devices hang on the side of the pool, they offer a much narrower response time because of their closeness to the water surface. If your kid wanders in or falls in, you’ll have to act immediately. These pool security systems use a sonar grid beneath the water’s surface to detect a breach and sound an alarm. Since they use sonar instead of motion, these systems won’t sound false alarms due to wind-generated movement of the water. However, they are sensitive enough to detect even the smallest body (around 15 pounds). These systems are completely automated and re-arm themselves automatically. 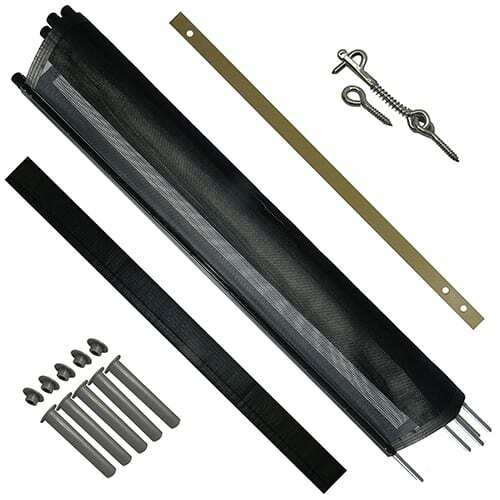 They provide an excellent primary security system for any size or shape of pool. These are always activated in the pool, so there is no way for a child to sneak or fall into the water without an alarm sounding. Underwater motion pool alarms are always on. You’ll need to physically take it out of the pool and switch it to it’s “sleep” mode before jumping in the pool or the alarm will sound. Personal immersion detectors are good solutions that work in tandem with a base alarm unit. Typically, each child wears a wristband that sounds an immediate alarm to one or more base stations the instant they come into contact with your pool. These aren’t something your kid should wear all the time, but they great for use while your child is outside working in the yard with you or if they’re playing by the pool. You can put one of these bracelets on specific members of your family that shouldn’t swim alone. You can add them to pet collars too to keep them safe. The only real drawbacks with personal immersion detectors are they must be removed if the child wants to swim. Additionally, no alarm will sound if a child not wearing a wristband falls into the pool. These types of devices represent a good secondary security system but should not be considered as adequate for a primary detection system. These surface-based motion alarms are popular among pool owners because they tend to be relatively inexpensive and work well when a calm, flat surface is disturbed. These use electronic signals to measure displaced water and waves created by objects of a certain weight. These types of alarms are good secondary systems. 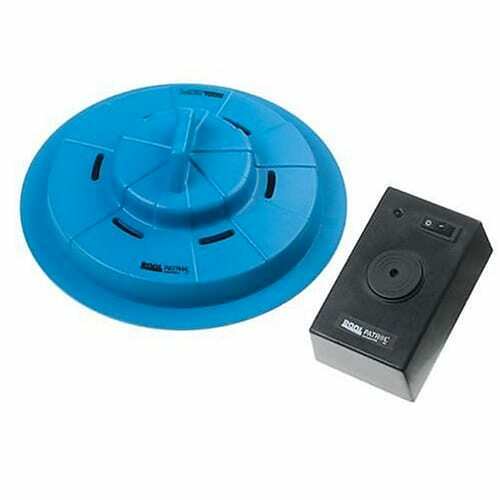 These floating pool alarms can be used in above and in-ground pools. While reasonably effective, surface alarms can sound an alert when disturbed by strong winds, so you can get a false alarm. Popular Models: The Pool Patrol PA-30 is a popular choice on Amazon. Poolguard PGRM-SB is another that floats on the water’s surface and is a bit cheaper. Unless you’d like to install a permanent fence around your pool, you can purchase temporary fencing to keep kids and animals out of the water when they’re not being supervised. These are removeable, so once your kids grow up, you could do away with them. Just make sure to check with local laws in case your town requires fencing around your pool at all times. These are pretty pricey. Budget to pay around $100 for every 12 foot section. Keeping your pool covered when you’re not in it can not only help keep it clean, but much safer. There are hard covers and soft covers, but as long as the cover can support the weight of an adult and is ASTM (American Society for Testing and Materials) approved, you should be good to go. 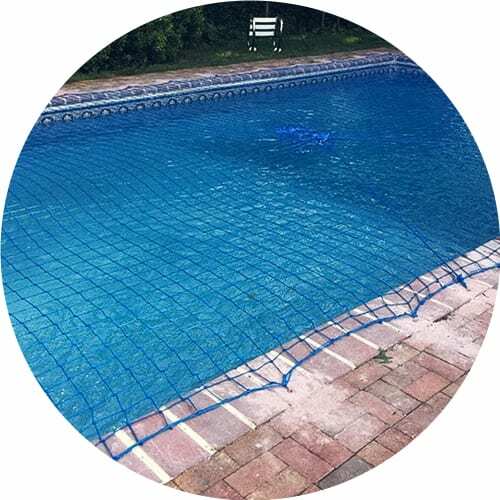 This certification ensures that the pool cover can hold substantial weight (usually around 4,000 pounds), keep kids from slipping into the pool by lifting up the sides, and prevent too much rainwater from collecting on its surface. These pool covers (if they’re ASTM certified) make it virtually impossible for kids to get into the pool when you’re not around. Unless they know how to unhook the cover, they won’t be able to get in under the sides or fall through the top. These are expensive. For a 15’x30’ pool, you can expect to pay over $500 for most brands. If you don’t want to spring for a heavy and expensive pool cover, you can get a net. They are exactly what they sound like: a woven, hammock-like net that goes over the top of your pool. The holes are big enough for small critters to get inside, but not a toddler. They’re lighter and easier to maneuver. Some brands and models are much cheaper than pool covers. Pool covers offer additional perks of keeping your pool clean. Plus, animals or kids could get tangled in the net and get into trouble that way. These are cheap pieces of equipment to keep all animals safe around your pool. These won’t tell you when an animal is in the pool, but it will help them get out on its own. The bottom line is that if you have a pool, you need proper safety precautions to keep people safe while in and around it. Since home security and pool alarm systems come in many shapes, sizes, and configurations, let SafeWise help you discover the best security systems for all of your home security needs.